Now that is good news at the end of a long week, and somehow all the effort we put in after the hail in May 2009 seems worth it. Here below is Jancis’s article on the wine, taken from the freebie part of her site. (Subscription costs £69 a year for ‘Purple Pages’ – essential reading for any wine nut.) Jancis then kindly tweeted the link to her 90,000 followers on Twitter. I did the same for my, er, 1,193. “Purple pager Gavin Quinney must be a pretty good salesman. He has managed to have his wine served as the house white chez both Gordon Ramsay and Rick Stein, completely unrelated world-famous television chefs. 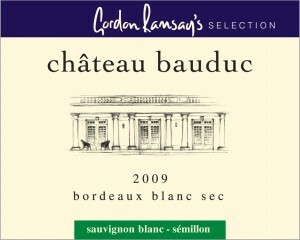 In fact Ch Beauduc Bordeaux Blanc has been Ramsay’s house white (as witness this particular label) for 10 years now. “I’m delighted to say, however, that he is not such a persistent salesman that he has actively tried to sell his wines direct to me. (Thank you, Gavin.) 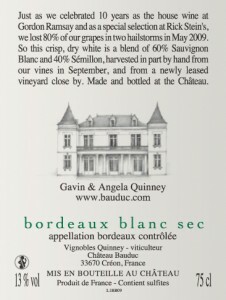 I had to wait until From Vineyards Direct sent me three of their recent finds to try before being exposed to Ch Bauduc 2009 Bordeaux Blanc, which I strongly commend to you at the FVD price of £8.95 a bottle – the same price as the Quinneys sell from their warehouse in Surrey. “Ch Bauduc is one of those hundreds of properties in the pretty Entre-Deux-Mers region struggling to make a living and an impact on the international market. Gavin and Angela Quinney have been running this property near Créon in the far north of the region since Gavin went mad and bought it after a rush of blood to the head at Vinexpo exactly 12 years ago. You can read Jane Anson’s short profile of them and the property here. 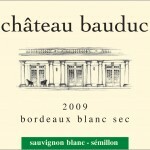 They sell much of their wine direct (this is the link for this particular wine) – a wise alternative to being entangled in the middle-man-heavy conventional Bordeaux trade. “What I liked about this wine was its crystal clear, particularly precise, piercing nose followed by attractive smokiness and good palate weight. “In fact this has so much extract (no excessive yields here) that there is just a tiniest hint of the oiliness of some white Graves, but it rises above this to be a thoroughly fine dry white bordeaux (and it’s much cheaper than most white Graves). Residual sugar is 2.94g/l and acidity is 3.9. I would chill this quite heavily for aperitif drinking but, served at room temperature, it would make a lovely wine at the table. Excellent value. “Gavin reports, ‘being hit by hail wasn’t the best, but we did get lots of encouragement following our homemade video on our blog. For more on the other vineyard and the harvest, see our hail blog’. I should also point out that the 2009 is the ‘prestige’ house white at Hotel du Vin and the exciting new Bistro du Vin restaurants in London. More on that anon. Any comments gratefully received. One friend and customer has suggested (via Facebook) that we should sign up FVD’s PR outfit. We checked with Jancis and will follow it up. Well deserved recognition on the wine and direct sale effort. But HRH omitted the excellent customer service and insightful blog that goes with it. Nevertheless, it's a reason to celebrate.